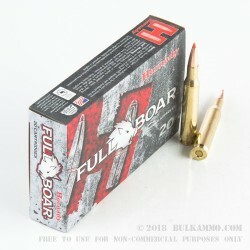 Hornady’s Full Boar line of ammunition promises to provide the ultimate shooting experience to hunters who are doing their part to combat America’s terrible feral hog problem. 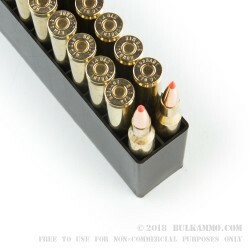 All Full Bore cartridges are manufactured with only the finest components at Hornady’s disposal, and each load is matched to the amount of propellant that will ensure optimal pressure, velocity, and volume. 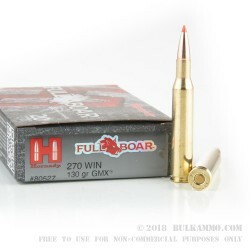 This 270 Win cartridge sports a 130 grain GMX projectile. Its one-piece copper alloy construction won't separate, and delivers devastating terminal performance, deep penetration, and 95 percent weight retention. Its monolithic construction also makes it perfectly legal to fire in places where lead ammunition has been banned, including California. This bullet’s polymer tip is driven into its hollow cavity upon impact to initiate devastating expansion, and streamlines its form for better accuracy as well. The bullet’s long, sleek profile is further complemented by its crimping cannelure and pressure relieving grooves, which work together to reduce bearing surface as well as fouling.